Fees: 310 euro, whereby €150 is to be paid at registration and the remaining amount of €160 is to be paid latest by the 13th of May 2016. Last date for registration 28th of April. Welcome to join this Karma Yoga Weekend Retreat! 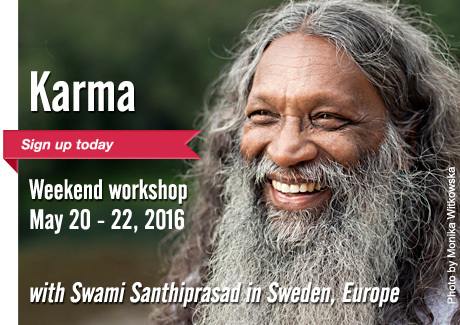 We kindly invite you to an inspiring weekend workshop with Swami Santhiprasad. The subject for this workshop will be Karma Yoga. With a warm and loving approach, Santhi gives us the opportunity to understand ourselves and how to improve our quality of life through the Theory of Karma. Karma means action. Karma also means reaction. Every action is followed by reactions. Actions and reactions continue as a chain binding us in birth and death. Breaking this chain of birth and death is liberation! Fulfilment of actions happen only when there is full focus. Often when we are doing things, half our mind is either in the past or in the future. This means that we are seldom present with the action itself, and thus are not fulfilling our karma. Full focus offers a special skill. Karma Yoga says “Yoga is skill in action”. Doing your actions without expecting the results of your actions is the essential theme of Karma Yoga. All meals are organic and vegetarian. Tea / coffee / breakfast / lunch / dinner, course material and a certificate of participation is included in the fee. 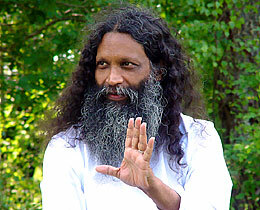 Welcome to meet Swami Santhiprasad! Swami Santhiprasad, spiritual leader and Yoga Master at School of Santhi Yoga School in India are conducting talks, seminars, workshops, Satsangams, Meditations and Yoga Teacher Training programs in India and Europe. Welcome!